I received today’s featured cigar with an order of cigars I placed with La Tradicion Cubana a couple of months ago, before they had been released into the market. Luis (Sanchez) told me to try them and let him know what I thought about them afterward. I smoked the first two and thoroughly enjoyed them, and thought today I would make a few notes about the final one and publish a more in-depth review rather than just another passing mention on some social media site. La Tradicion Cubana produces the Tempio in the Dominican Republic for T.L. Johnson Cigars, which is based in Colorado. You may be more familiar with T.L. Johnson for some of their other lifestyle products – personally, I’ve been a fan of their flyrods for a very long time. In fact, I knew about the flyrods long before I ever had an inkling of the cigar connection. As best I can tell, the only place I have found online to purchase these is at [REDACTED; shop now closed. These are more widely available than when this originally published though…], and B&M distribution is predominantly limited to Colorado according to the TLJ website. 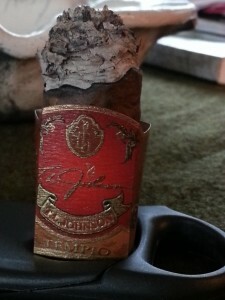 The robusto (5X50) that I’m smoking today retails for about $11.80 per stick at CIGARSTIX and is available in boxes of 10 [EDIT: I have heard from Terry Johnson that since the original release, the pricing has been revamped and current SRP before any state tax is now between $8.00 to $8.40 per stick. BONUS!]. The binder and filler blend on these is composed of Nicaraguan and Dominican tobaccos, with a Pennsylvania wrapper. Aside from the PA wrapper, one of the things that interests me most on the first glance is the sharp press on this cigar. In fact, it is commonly referred to as the Tempio “Extreme Box Press.” Luis uses a closely guarded method of pressing cigars into such a sharp shape; a method he says requires up to three weeks to perform. 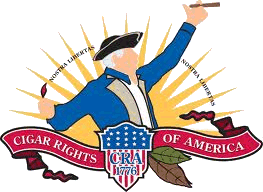 Whatever he’s doing, it works – I have had the pleasure of smoking a few different cigars from LTC produced in this fashion and I am consistently amazed at the draw he is able to preserve in such a press. The color of the wrapper is fairly uniform, reminiscent of well-oiled leather, with some slight mottling. At the risk of carrying the leather analogy too far, I’d use it in describing the feel of the wrapper as well. There is no discernible sheen to it, yet it feels very supple. The veins in the leaf are readily visible, but very smooth from the intense press. On both the wrapper and foot, I get very little in terms of prelight aroma. There is just the faint sweetness of tobacco. The flavor of the cold draw is also very sedate, and retains a bit of the sweetness noted in the aroma. Remarkably, the freedom of draw is still dead-on, even with the extreme press. From first puff, there is an assortment of toasty flavors. In the VERY early minutes of the smoke, I find a pleasant tingle in the nose upon retrohale, accompanied by a light cedar flavor which I enjoy greatly as well. The first of these I smoked presented an unfailing, razor-edged burn – although today’s stick is producing a bit of a wandering ashline early in the cigar. Nothing serious, mind you, and quickly corrected with a brief touch of the flame. The ash has a flaky appearance throughout, although it has the backbone to hang on to an inch or more. Entering the midsection of the smoke, I find that cedar frequently popping its head up for a puff or two, but the predominant flavors to me are still quite toasty – that of a sweet charred oak in my mind. I’m reminded of the aroma you’d find emanating from an old whisky barrel. If you enjoy smoked meats or a smoldering hardwood fire, you’re bound to find something you love in the Tempio. 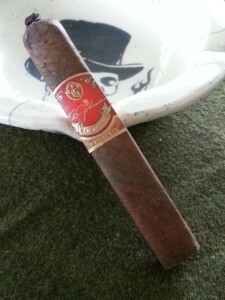 The burn during this portion of the cigar still has a bit of a roaming nature, but is still well within normalcy. I mention this merely in passing – it never becomes bothersome, nor distracting…and I have been known to fidget obsessively with the burnline of a cigar on many occasions. I have noticed that the press will loosen slightly as the burn approaches it. However, it retains much of the squared profile up until the last minute before combustion. As for potency, I’m finding the Tempio to be quite centered within the medium range. It never builds into what I would call full-strength by today’s standard – yet you’ll certainly not forget that you’re smoking a cigar. 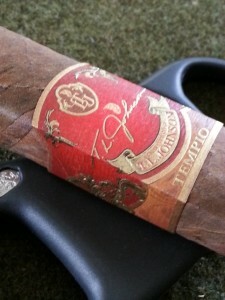 Going into the final stretch with the Tempio, I find an occasional sweet citrus flavor that is a very pleasant surprise. It’s fleeting, but makes for a nice diversion. The toasty flavors continue to build and develop, and have become quite “dark” by this point. This citrus, in addition to the sporadic cedar that creeps onto the palate, really stand out and create a nice backdrop for the leathery, charred wood in the profile foundation. The contrast truly makes them pop. The burn has corrected into the sharp, well-behaved line I was familiar with in the first two of these I smoked. I found the Tempio to be a welcome addition to the market, and my repertoire. I do wish it were more widely distributed, and I am sure it will become so in the coming days. The dark, toasted nature of the flavors presented appeal to me greatly, and the lighter flavors that make occasional appearances throughout form a perfect substrate to really showcase them. Personally, I find this to be a great asset to a cigar. The flavors are very complementary, and make for such an enjoyable experience all around. 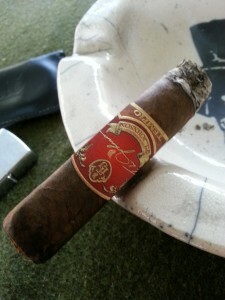 This is definitely a cigar worthy of investing a carefree afternoon. Given greater availability, I would not hesitate to keep some squirreled away in my humidor for just such an occasion. Nice review Kip. Terry Johnson lives right up the road from me. I will tell him to check out your review (if he hasn’t seen it already).